Ahead of their co-headlining show in the Entry, Early Eyes answered a few questions for today’s Local Spotlight feature. The young and talented indie rock band headlines 7th St Entry on July 31 along with Hardcastle and Love Sequence. I had the opportunity to sit down with Jake Berglove (vocals, guitar), Des Lawrence (bass), and Wyatt Fuller (drums) (guitarist Joe Villano couldn’t make our interview) and talk about the band’s swift rise in popularity in the ten months they’ve been together. The band’s influences range from motown and funk to modern indie rock, with artists like Amy Winehouse, The 1975, and Tears For Fears as featured inspirations. “We’ve never sat down and defined ‘we want to sound like this.’ We all just took our influences into the practice room and jammed,” says Lawrence in regards to this diverse range of music tastes coming together to form one cohesive project. Their sound is reminiscent of indie rock bands like Hippo Campus with added tinges of pop and funk. The group’s uniqueness lies in its unwillingness to adhere to a predetermined genre, instead choosing make the music they want to hear. The band formed last October when Lawrence booked a show at the University of Minnesota and his musical partner fell ill and was unable to perform. With only a short time before the show, Lawrence had to improvise: “That was right around the time I met these fine fellows. We learned some of Jake’s old songs, wrote a couple songs and threw together a thirty-minute set.” Their quickly-organized project was very well received, and has successfully developed even more fully in the last few months. After a winter of writing and recording, the band released their debut EP, Minutes, in May with a show at the Entry. For the EP, “we had a pool of nine or ten songs. We tried to pick ones we thought would catch people’s attention,” says Berglove. The result is an energetic and overall happy indie/pop/rock effort recorded mostly in the band members’ dorms. This DIY recording style doesn’t hamper the quality of the record, though, instead adding another layer of texture to the tracks. In terms of their writing process, their approach similarly avoids over-thinking and fussiness: in general, an idea stems from one member followed by a jam session until a song is produced. Berglove notes, “it’s about finding a balance between what means stuff to me, and what means something to everyone else. With our lyrics we’re trying to spread a positive message, and trying to bring people together in a room.” In the process of putting together another EP, the band welcomed a new guitarist, Joe Villano, who has been working on contributing his own flare to the next release, adding to the sense of community and collaboration. In addition to starting work on their next EP, the band has kept busy playing shows all over Minnesota, with plans to expand beyond their home state. After their show at 7th St Entry, they’re “going on a little bit of a regional tour of reno shows,” explained Fuller. July 31 is a can’t-miss gig as they debut a few new songs before heading out on tour. The last time they played the Entry for their EP release show, “was the most fun I’ve ever had at a show,” exclaims Berglove. Fuller adds, “It felt cool being connected to that many people, and knowing that they’re there for you.” Early Eyes has managed to carve out a little following in the Minneapolis music community, and it’s paid off. I asked them about the music scene here, to which Berglove replied “I love the local Minneapolis scene. It’s the best scene in the world.” “Literally I think everything we have is due to people spreading the word and helping us out,” Fuller continued. 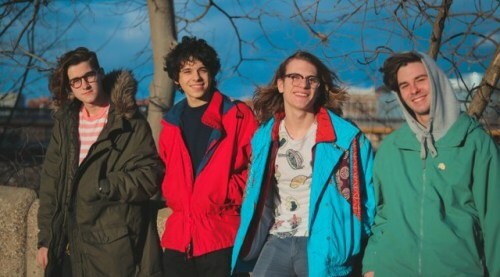 Early Eyes’ success is a good example of how welcoming the local scene can be to newcomers. Head down to 7th St Entry on Monday, July 31 for the debut of a brand new track from Early Eyes, a band that has quickly risen in popularity while maintaining a humble and gracious attitude. Plus, catch Nashville indie rockers Hardcastle and local pop dreamers Love Sequence. Snag your tickets here!